Such sweet faces and those little pompoms finish them off just perfectly. I was in choir in high school and we made many caroling trips to hospitals and senior centers. Most people were happy to see us or at least friendly, but a few elderly folks didn’t mince words letting us know they were lonely all year round, not just at the holiday season. Living in Western Australia where the weather rarely dips below 30 degrees Celcius (86 farenheit) at Christmas time, cuddled up carolers are one of those things that we only see in the movies. In fact carolling in general isn’t part of Christmas life here in Oz. These cute little carolers would bring a little bit of the fantasy white Christmas into my lounge room that I hope to experience one day. I remember caroling as a girl scout. We caroled in a parade where we were drowned out by a marching band or something like that. My favorite part was caroling at nursing homes. I found you through Jenny’s flicker project. I’m so happy to have found you. Your carolers are beautiful. My little five-year-old “carols” every time we go to Grandmommy’s house: when Grandmommy comes to the door, my daughter starts singing! 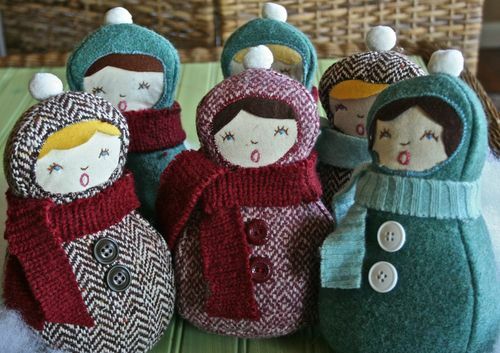 I think they are adorable and I agree you do need to make a bunch to have carolers! My favorite caroler story would be the only one I have at the age of 50 something. Two years ago we were at my daughters and I always said that I never had carolers sing for me but when te kids were little we always did the caroling. So my daughter kept telling me she had a suprise for my husband and I this christmas eve and low and behold a fiend of hers and their group of carolers surprised us with our own private little show and I cried. What a warm holiday feeling that was. One I will never forget. I hope you and yours have a wonderful holiday season. These are precious. They remind me of when I was a kid. My mother would gather all the neighborhood kids together for Caroling practice. We must have had 20 kids in our house every Saturday. When our caroling day came, we’d hit the neighborhood singing. Mom would direct us and my father would tote a big wagon with hot cider and gingersnaps for all. But when I was a kid, my friends and I did actually go carroling once. We were about ten years old ,and there were four of us. We had just watched a Christmas movie that had caroling, and had never seen it in real life before, so we gave it a shot! I think we hit up about 6 houses before we decided to go back home. ha ha.. We didn’t have much luck, but it’s a fun memory! I love your site. I found you via “The Crafty Crow’s” Facebook page. Although I have always wanted to go carling, I have never had the opportunity! However, one Christmas eve, after my husband and I had been really ill throughout the year, we heard some singing outside our window and found some carolers singing away in our Nebraska winter cold. How beautiful it was! I love Christmas music anyway, but this was just so personal. I had no idea how to resond. Do you give out cookies and hot chocolate, donations, just smile? I had just purchased the candy canes to put on the tree and had just enough to share one with each caroler. So glad! What do you do when you find carolers? I still don’t know! Maybe candy canes are enough?! Love the look of the carolers, they remind me of going caroling here in Michigan, sometimes you are so cold that your teeth make their own music!!! Oh, adorable! I love their little O mouths! And caroling with my son’s preschool class is about the cutest thing ever – we go door to door into all the nearby stores and retaurants. My mother used to drag us around the neighborhood singing while strumming her guitar. I used to be mortified on the outside, but truthfully really enjoyed the singing. Boy do I wish this stuff happened more often. Thanks for the giveaway! The carolers are adorable. My father was burned severely, when I was in first grade. He made it home (quite prematurely and only for a few days) just so we could have Christmas. My mother always tells a caroling story about our neighbors who came to wish him a Merry Christmas and had no idea that he would have on very little clothing due to burns and skin grafts. Everyone had a good laugh, then and now. These carolers are the sweetest dolls – thank you so much for sharing your pattern and directions. Those dolls are beautiful! Thanks for a chance to win. These are very cute, and using recycled materials makes them even better. Our family usually sings carols to our neighbors as we make the rounds delivering holiday treats to them, and we all wear our Santa hats. Like Jacinta, no carolers in our part of the world either. Or Snow and winter woolies. We live down in Victoria, Australia and it is usually very hot here. But I love these dolls and love all white Christmas decorations. I will add this to my long list of things I must make one day. They are so cute. Thanks. These are adorable!! Thanks for sharing. I’ve got to make some! I have never been carolling and you should all be thankful…..I can’t sing to save myself! Your carollers however are gorgeous and I would love to make them. These are so cute! We don’t do caroling here in my country either, but saw it done in the movies and love the idea. Oh these are so cute, I’m definitely going to have a go at making some. I’ve never been caroling, but I sing my fair share of carols just around the house, especially whilst doing the watching up. I saw you on craft gossip. They are beautiful! I think i’ll do one (flat) to my christmas tree!!! These are so cute! Thank you for a great tutorial. Just in time for my ornament swap. These little Carollers are wonderful, we don’t have snow at Christmas here in Australia but we still appreciate all the Traditional Stuff. Thank you so much for this pattern, I would love to make it for a friend of mine who lives in America and does experience snow. Thank you for sharing your pattern. They are darling!! I have 5 sisters so we had our own choir, lol. We all loved to sing too, though we were not very good. Love the little carolers. So cute and they look a lot warmer than I ever did caroling. And I bet their noses never run in the cold either. Thank you for this Tutorial! It´s just the perfect Idea for a little X-Mas present for my whole girlie friends! I put the link on my blog if you don´t mind! We often go caroling with our church to the shut in families. The families really appreciate it but we seem to enjoy the joy in their faces even more! Thank you for this tutorial ~ so fabulous and generous ~ I love them! Thank you for the tutorial…those are ADORABLE! These are so adorable! I love sewing but just recently taught myself hand sewing and I am really loving it. I machine sew lots but hand sewing just seemed like it would take so much time. I was missing the point…the joy comes from making the project not getting it done! That is just adorable. I used to be in the choir nad we caroled for a group of sick kids in a hospital. That will always be an experience I will never forget. My family goes caroling around the neighborhood every Christmas Eve, since I was a small child, so I have lots of stories to tell. My favorite year, though, was when there was about 6 inches of snow on the ground, it was just below freezing (so not too cold), and big snowflakes started to fall. The world was hushed, white, and glittering in the light of our railroad lanterns and candles. Then a car pulled up and Santa got out! He pointed to a nearby house and asked if we would sing there. There was a big party going on, with lots of children. We started with Joy To The World, then Deck the Halls, and finally Santa Claus Is Coming To Town… and Santa came around the corner and up the steps & into the house. Oh, the kids were screaming and excited! That must have been 30 years ago and I still treasure the memory. guess who’ll be looking more into making these creatures! Me encantaron estas muñecas! Apenas pueda voy a hacer una…para empezar! I love your carollers! 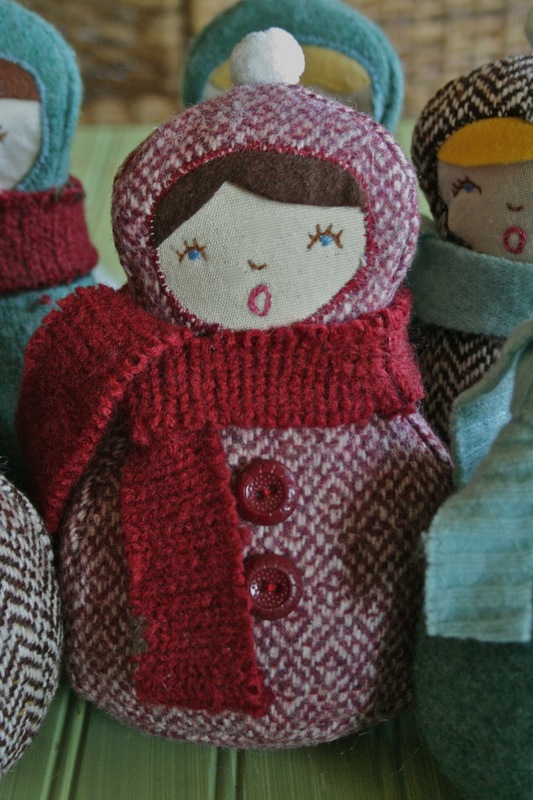 I’m adding them to my sewing list – they’re too cute too resist. I was wondering if I could ask you for help? I want to upload a tutorial to my blog using pdf format and wondered how you did yours. Yours looks so professional and is a brilliant way of sharing. I don’t want to impose on your time but, would you be able to help me? Thanks. I can’t get your pdf download to work. Any hints you can offer? I have the Adobe Reader X – the new upgrade. I said before I couldn’t get the pdf to work, but ignore that. Suddenly it worked for me. Ah, sweet mysteries of Computers! The only time I’ve ever seen carolers was when I was living in a little apartment in a small town. I heard a noise, and opened my windows. About twenty carolers were standing out on the sidewalk, signing to the building. I left the window open, even though it was freezing outside. It was really beautiful and magical. never been caroling, unfortunately. Or fortunate, since I don’t have much of a singing voice. I love this! I hope you don’t mind linking to it from my weblog! I just wanted to add as well, that the flickr link in your pdf is acting funny. I can’t click it and if I copy it, it pastes like this: ‘&&<#WPHPHHgGhGXW!